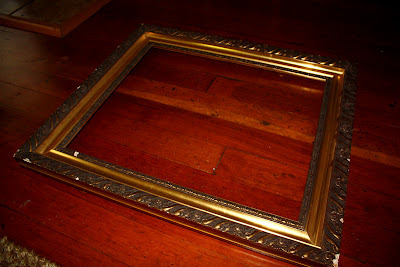 Since I first saw framed chalkboards on Miss Mustard Seed's Blog I've wanted to make one. I've been on the lookout for a large old frame and I lucked out on my last visit to my parents' house, my mom had a frame she was willing to part with. 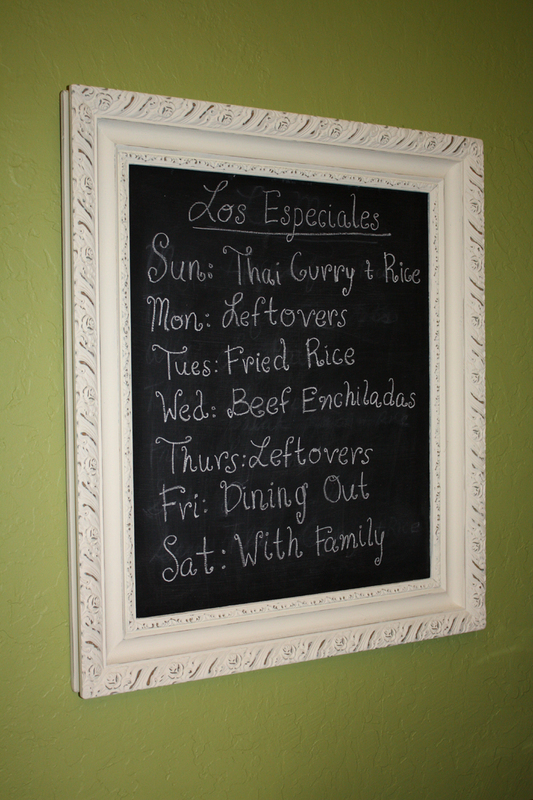 So I got to work on it and thought it would make a perfect menu board for our dining room. Brian and I have been bad of late, eating a lot of freezer dinners and it has begun to show in our waistlines! 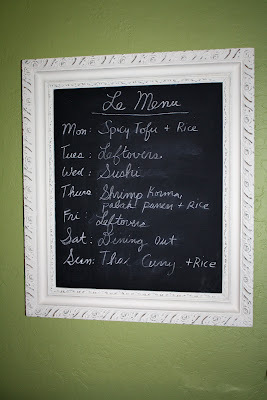 Hopefully having a meal plan for the week will encourage us to cook more, there's no ignoring a big menu on the wall! For some reason we were in the mood for a lot of Asian food this week?! 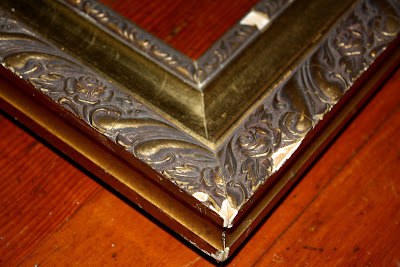 The frame was a bit beat up when I first started working with it. I didn't mind as I planned on distressing it at the end. But I did fill in some of the larger chipped areas with wood filler. 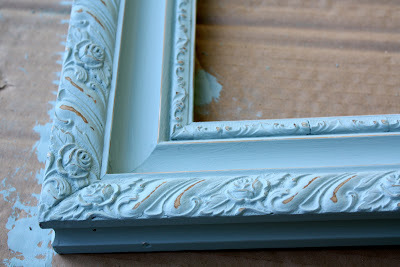 After filling in the chipped edges I painted the frame with my Annie Sloan chalk paint in "Duck Egg Blue", the same color I used on my dining chairs. 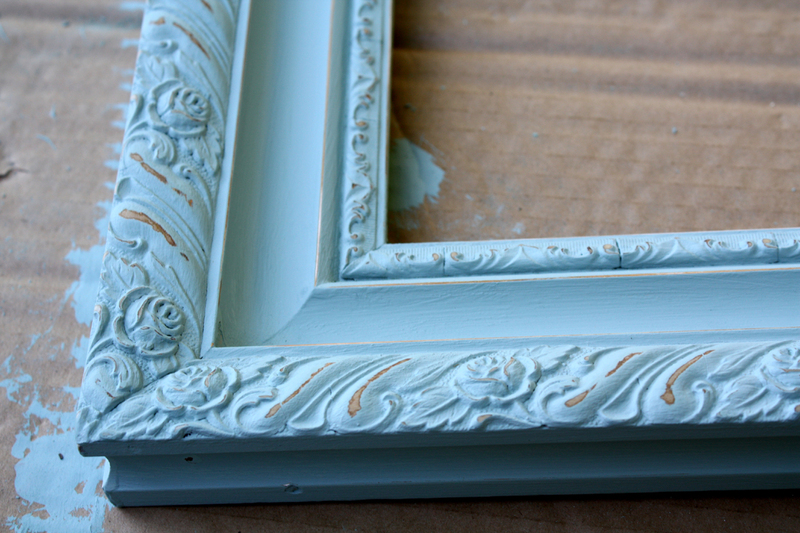 When I took it inside it didn't pop against the green walls as I had hoped, so I decided to try chalk paint in "Old White". I had ordered a couple sample colors of the Annie Sloan chalk paint from Shades of Amber a while back. The sample was enough to paint the frame and I have about half left over. So the sample is not enough to do a large piece but enough to see how it works if you are interested in trying some out. I bought a piece of plywood and measured it to size and Brian cut it out for me. 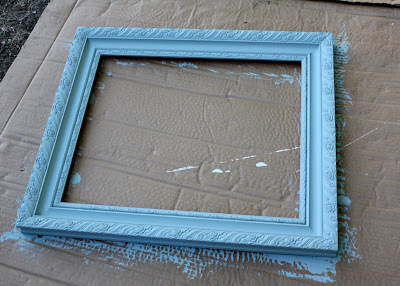 Then I put on a couple coats of primer and three coats of chalkboard paint, sanding in between applications. I put the chalkboard in the frame, hang it up on the wall, and then made up our menu for the week. So far so good, although we have gotten a little off schedule some nights. The fried rice lasted for a couple nights and Brian went out to dinner with a friend one night but we are doing A LOT better preparing meals than before. Hopefully we stick to the plan! Great chalkboard the white does look nice against your wall. I love chalkboards I've made two so far, stop by for a blog visit.